Groups concerned about the health effects of radioactive fallout welcomed today’s release of a National Academy of Sciences (NAS) report recommending that eligibility for the federal compensation program for people suffering from cancer connected to U.S. nuclear weapons tests not be limited to its current geographic boundaries and urged Congress to move quickly to assist sick downwinders. The NAS study said that Congress should implement science-based changes that, in effect, would extend coverage of the Radiation Exposure Compensation Act (RECA), which is now limited to residents of parts of Nevada, southern Utah and Arizona as well as workers who handled uranium. Kimberly Roberts of Physicians for Social Responsibility (PSR) welcomed the NAS recommendation for a broad federal education and communication program about fallout risks. “Patients must have access to information to make informed decisions about their exposures. Congress should include physician education and outreach as part of any new RECA legislation,” Ms. Roberts added. RECA was originally passed by Congress in 1990 and amended in 2000. The legislation was historic because it was the first time the government publicly acknowledged that downwinders and uranium workers had been hurt and deserved compensation. In the 1950s and early-1960s, the U.S. conducted nearly 100 aboveground nuclear weapons tests. A National Cancer Institute (NCI) study on the health impacts of fallout released in 1997 found that millions of people in the U.S. received significant doses of radioactive iodine and that hot spots occurred thousands of miles from the test sites. The NAS investigation began in 2002 to assess recent scientific evidence, including the NCI data, to determine whether other groups of people should be covered under the RECA program. 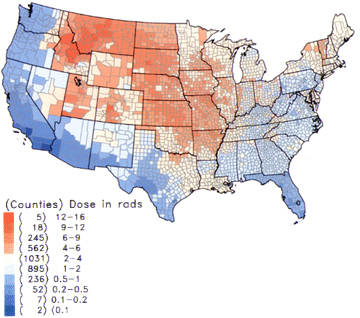 Attached: NCI map showing areas with radioactive iodine fallout from U.S. nuclear weapons tests.